A well-designed frosted business card adds authenticity to your business. It has the capability of making you stand out of the crowd and make a good and lasting impression on others. However, there are some guidelines to follow in order to make your visiting card outstanding and exceptionally impressive. After selecting the design, make sure you keep proper spacing and design your card to give clear and distinct information about you and your company. There are no hard and fast rules to have your business card in stereotyped shape and size. 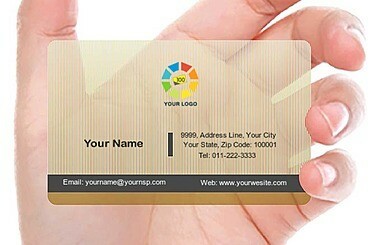 Depending on your business type, you can use your creativity and alter the shape and size of the cards. Do not agree to the font size and borders which the printer suggests to you. Make your specifications clear beforehand. The material and the finish of the card is very important. Make sure you choose the one that fits in your business type. Nowadays people are designing their business cards in such a way that one can make a decorative piece out of it. This can be the product you manufacture or offer. This will leave a great impression on the recipient. Old visiting cards, envelops and postcards can be recycled and used for business cards. It will help you stay environmentally friendly and help you express your creativity in an innovative and exciting way.